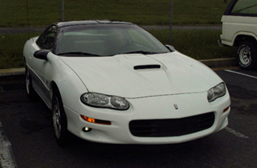 This install was donated to Install University by Brian (Fireball on LS1.com). Special thanks to Kris (99WhiteSS) for donating his car for this install and David (99SilverTA) for his help. NOTE: All effort has been made to make this as accurate as possible. Some intermediate steps have have been accidentally omitted. Please consult a Helms manual or a professional mechanic if a problem not covered in this install arises. Pictured below is the car that is getting a clutch transplant. After removing the console (2 7mm bolts, 5 10 mm bolts) Remove the 7 bolts (7mm) holding the cover over the shifter. 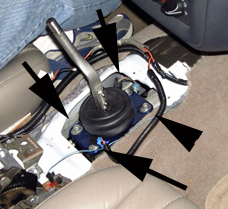 After Removing the boot, remove the four bolts holding the shifter down. These will vary depending on your particular brand of shifter. Make sure the car is in neutral prior to removing the shifter Also remember to disengage the E-brake prior to working under the car. Quality Brake Repair at Guaranteed Lowest Prices Starting at $89. Remove the 4 U-joint bolts with an 11mm socket. Note: 2 of the bolts are on the other side, just rotate the drive shaft around to access them. 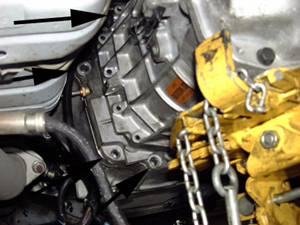 Once the bolts and straps are removed, pry the drive shaft forward by placing a screwdriver or extension between the drive shaft and the rear yoke. 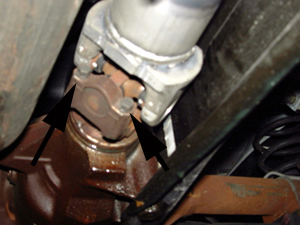 Pull the drive shaft out of the transmission and either remove from the car or put out of the way. Also, this is a good time to check for a leaky pinion seal. Notice how this car is leaking. 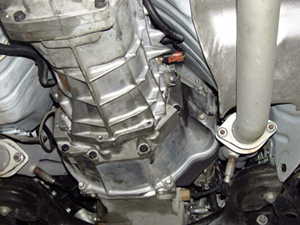 Remove the 2 15mm bolts that secures the y-pipe to the transmission. They have already been removed prior to this picture. 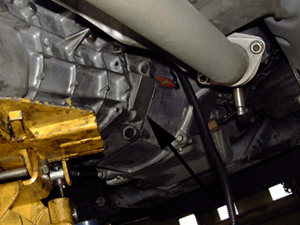 Support the transmission with a jack and remove cross member by removing the 4 15mm bolts and the one 18mm bolt. Put the cross member out of the way. 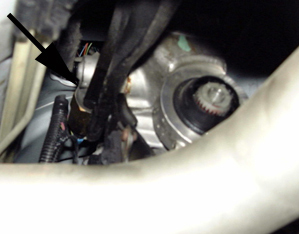 Remove the upper torque arm mount with a 15 mm socket (shallow socket). Remove the 2 15mm nuts above the bracket and remove the torque arm mount and bracket. Remove the 2 13mm bolts holding the transmission mount and put the transmission mount out of the way. 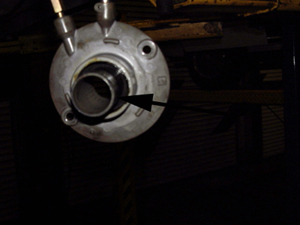 Remove the 8 15mm bolts holding the transmission to the bell housing. NOTE: The top to bolts are easiest to remove using a long extension from the rear of the transmission. 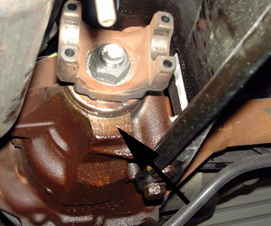 Once these bolts are removed the transmission can be slid back several inches. NOTE: Not all bolts are shown in this picture. Remove the 2 10mm bolts with a 10 mm box-end wrench. Then pull the slave forward and around the front of the input shaft and let hang freely. The transmission can now be lowered and put out of the way. This is a picture of the 288 slave hanging out of the way. 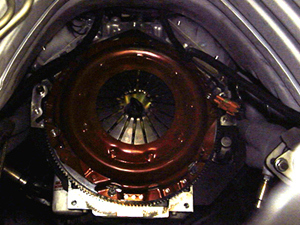 Remove the 8 13mm bolts holding the bell housing to the engine. The use of a swivel socket is a necessity to get to some of these bolts. 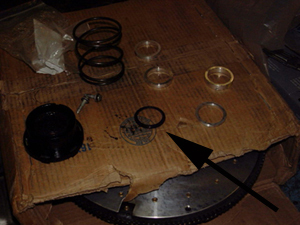 Remove the 6 13mm bolts holding the pressure plate to the flywheel. 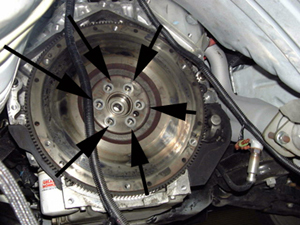 Be careful, the clutch disk will fall down once all the bolts are loosened and removed. 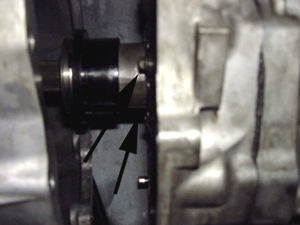 Remove the 6 15mm bolts holding the flywheel to the crankshaft. Remove the Flywheel and set aside. 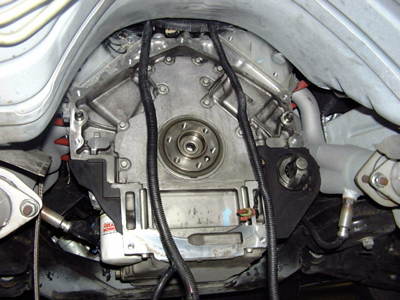 This is what the engine should look like prior to installation of new clutch. 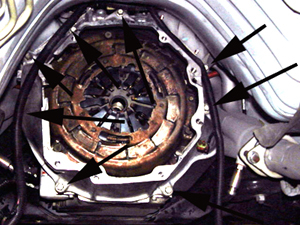 Install new flywheel and torque the 6 bolts progressively to 74 ft-lbs in a criss-cross pattern. Use a flywheel tool (or equivalent to hold the flywheel during torqing. 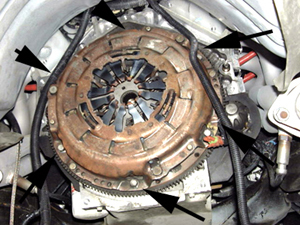 (sorry no picture) Clean the surfaces the clutch will touch on the flywheel and pressure plate with brake cleaner. DO NOT touch these surfaces after cleaning. DO NOT touch the clutch lining! 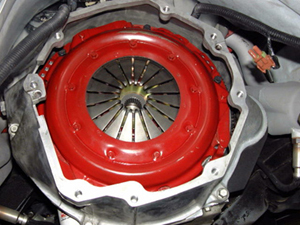 Oil/grease will reduce clutch life and hinder performance of the clutch! Use a clutch alignment tool to hold the clutch in position and then install the new pressure plate tightening the bolts to 52 ft-lbs in a criss-cross pattern. 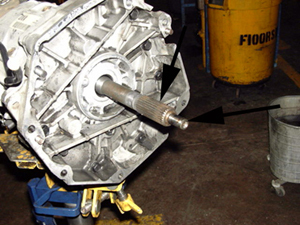 Place some white lithium grease on the input shaft of the transmission at the 2 locations marked. Hoist the transmission back into position then slide the TO bearing back on the input shaft. Reinstall the 2 10mm bolts (see removal pic above) Install the transmission on the bell housing by shaking and height adjusting until the input shaft has slid into the clutch. 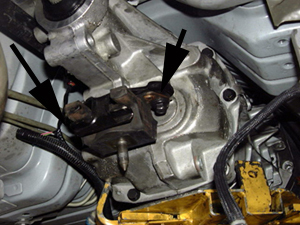 DO NOT FORCE Until the shim choice is confirmed, install the transmission with 2-3 bolts (15mm). Note: Refer to relevant pictures above for these steps. Install the transmission mount finger tight and install the cross member with 2 13 mm bolts for shim testing. Also slide the drive shaft into the transmission and install the u-joint staps on the rear end with a 11mm socket. Install the shifter. Start the car in neutral. Try putting it in first gear. If it doesn't go into gear, install a thicker shim. If it goes into gear, test the engagement point by holding the brake and slowly releasing the clutch pedal. 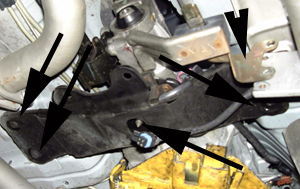 Ideally you want the clutch to start grabbing immediately off of the floor since once the clutch breaks in it will move towards the middle of pedal travel If it engages too high, install a thinner shim. 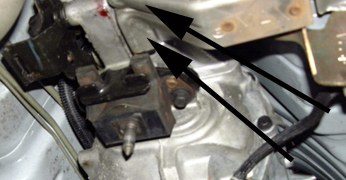 Change shims (if necessary) by removing the shifter, cross member, transmission mount, the 2-3 transmission-to-bell housing bolts then pull back the transmission far enough to remove the slave cylinder. Change shims as noted above. Reinstall partially as described above And test again. Once the engagement point is correct, Remove the shifter, drive shaft and cross member and install the remaining 15mm transmission-bell housing bolts. 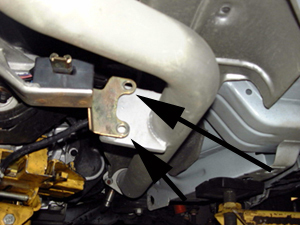 Install the torque arm mounting bracket and y-pipe mount bracket reversing the steps noted above. Pull the torque arm into the mounting bracket and secure with the single 15 mm bolt. Install the cross member (4 15mm bolts and 1 18 mm nut). Install the 2 y-pipe support bolts (15 mm, see above). Make sure all of the electrical connections have been re-established. This is what everything should look like now. Reinstall the drive shaft and double check all the connections and bolts. Lower the car. 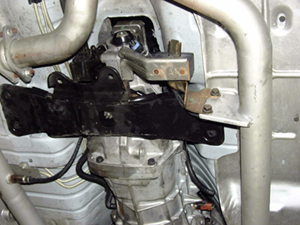 Any transmission fluid lost during install should be replaced through the shifter housing at this point in time. 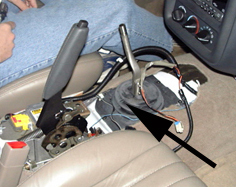 Place a little white-lithium grease on the shifter ball (the part that engages with the transmission) and reinstall the shifter, cover and console. 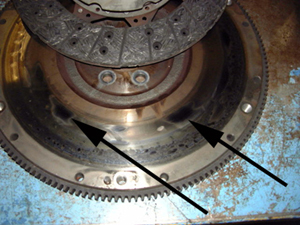 Here are some pictures showing the old clutch (notice the hotspots) on the old flywheel (marked by arrows). 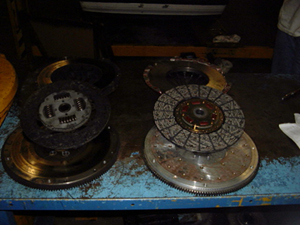 The second picture shows the old clutch and new clutch side-by-side.